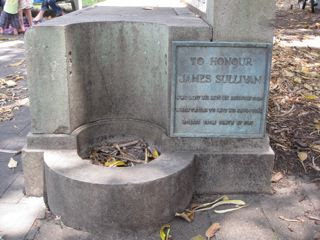 Just around the corner from our house is one of three places where I particularly like to take Sniff for a walk - Camperdown Park - and within the park is one of my favourite things: a horse trough dedicated to the memory of James Sullivan and erected by the RSPCA. horses from death by fire. Now this memorial inscription raises many more questions than it provides answers: who was his employer? where did this happen? 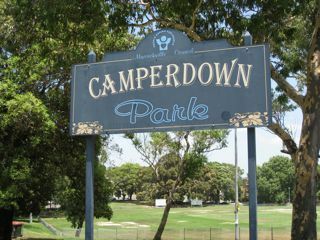 in Camperdown Park? did the horses die? It is so bizarre in its reduction of someone's life to a single act without even giving us the barest details of his life: was he young? was he Australian? was he connected to the RSPCA? was he shagging his employer? I could look him up on the internet and no doubt find answers to some or maybe even all of these questions but I prefer to remain in ignorance of the real James Sullivan and to imagine him, a young brawny, bronzed Australian, daily battling fire and rescuing horses, as if that was his sole occupation and purpose in life. The rest of Camperdown Park is a little like its sign: a faded glory. The circus lettering implies side-shows and tea-rooms but there are no excitements here. 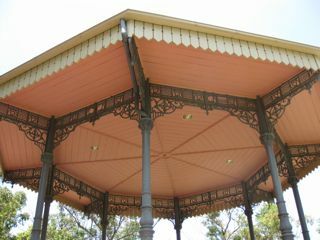 There is a magnificent bandstand but even this is merely secondhand. An iron plaque explains that it was built in 1888 by Souter and Martin at the impressive-sounding Globe Foundry for the larger and more central Hyde Park which replaced it with a new bandstand and an amphitheatre in 1910, subsequently giving their cast-off to Camperdown who promptly put it up in their park in 1911. 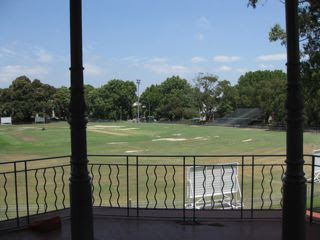 It has been, more recently, renovated and its ceiling painted a blushing pink under which boxers and tai chi experts do their daily work-outs. I'm going to go and raise a glass of something cool to James Sullivan. Farewell for now. Does James deserve a song? Now it looks to me as though the trough has gone beyond simple neglect - it has been filled in. Or does it perhaps have a lid? The water would have been in the middle - I'm not sure what the little circular things at the side are but they wouldn't afford very much slaking for a thirsty horse. Have you been to the Portuguese Ethnographic Museum of Australia yet? And what is the other long grey thing behind James' trough? 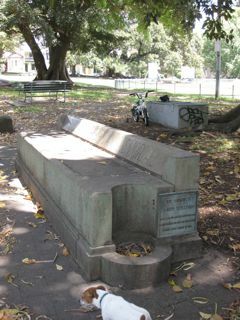 A trough to the memory of another Camperdown hero?